RoC Multi Correxion 5-in-1 Daily Moisturizer SPF 30 Review: Ingredients, Side Effects, Customer Reviews And More. RoC Multi Correxion 5-in-1 Daily moisturizer SPF 30 is an anti-aging wrinkle cream with added sun protection that claims to reverse five signs of aging, such as dark spots, wrinkles, and loss of firmness. This product has been re-continued after reformulation. The cost of the moisturizer is listed on the manufacturer’s site is $28.99. Though it is not sold via its manufacturer, it can be purchased via other retailers. About RoC Multi Correxion 5-in-1 Daily Moisturizer SPF 30 – Does it really work? The manufacturer claims that this product has a special breakthrough technology called Hexinol that can allegedly target all five of the main signs of aging: wrinkles, sagging skin, dry skin, dark spots, and dullness. What are the ingredients in RoC Multi Correxion 5-in-1 Daily Moisturizer SPF 30? Avobenzone: sunscreen agent that absorbs UV rays and coverts them to heat, which is less damaging. Homosalate: salicylate that prevents UV damage to skin. Its use has been linked to hormonal disruption. Octocrylene: an ester that prevents UVA and UVB damage. It is also known to increase skin sensitivity. Oxybenzone: an active sunscreen and photostabilizer. Retinol: a form of vitamin A that reverses sun damage in skin, decreases the appearance of wrinkles, tightens pores, and stimulates production of collagen. It’s best used at night as it is known to increase photosensitivity. Glycerin: A humectant that binds moisture to the skin. 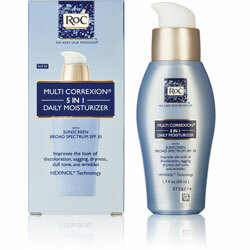 RoC Multi Correxion 5-in-1 Daily Moisturizer SPF 30 should be applied to clean skin fifteen minutes before sun exposure. Does RoC Multi Correxion 5-in-1 Daily Moisturizer SPF 30 have any side effects? Side effects have not been reported for RoC Multi Correxion 5-in-1 Daily Moisturizer SPF 30, but people who have already sensitive or dry skin should know that retinol may exacerbate these conditions. RoC Multi Correxion 5-in-1 Daily Moisturizer SPF 30 states that it can target five signs of aging, including wrinkles, dark spots, loss of elasticity, uneven skin tone, and decrease in firmness by using Hexinol Technology. However, the explanations for how this technology works are vague at best. It does help that RoC lists all ingredients in the moisturizer’s formula, but several of the ingredients are known to increase sensitivity in skin. Although retinol is meant to benefit the skin, it’s also known for being harsh. The manufacturer’s website lists a suggested MSRP, but customers must buy the product from other retailers and don’t have the option of purchasing directly from the company. Though the moisturizer is supposed to produce results in 4 weeks, no hard facts are disclosed that could be used as evidence for these claims. Several users of the product have stated that this product causes dryness and redness. Prospective customers may benefit from using a product that does not including sensitizing agents.